More than one-third of maternal deaths in Pakistan occurred among child brides ages of 14 and 17 years. Child marriage endangers girls' lives and limits their potential to get empowerment. Jaag Welfare Movement will provide education, skill, healthcare and gathered them in vibrant groups in rural areas of South Punjab for empowerment. This initiative will also be the collaborative & integrated approach to end child marriage by awareness raising and advocacy for change in laws and policy. Today the devastating impact of child marriage continues to be ignored in Pakistan. Millions of child brides, some only just past puberty, are denied access to health, education and economic opportunities. The majority of them are burdened with the roles and responsibilities of wives and mothers without adequate support, resources or capabilities. This project will benefit 200,000 girls in Punjab indirectly by law & policy reforms and 100 child brides directly to delay first birth to save life. Jaag Provides stationery, pocket money and uniforms to girls at risks of child marriage to get education. 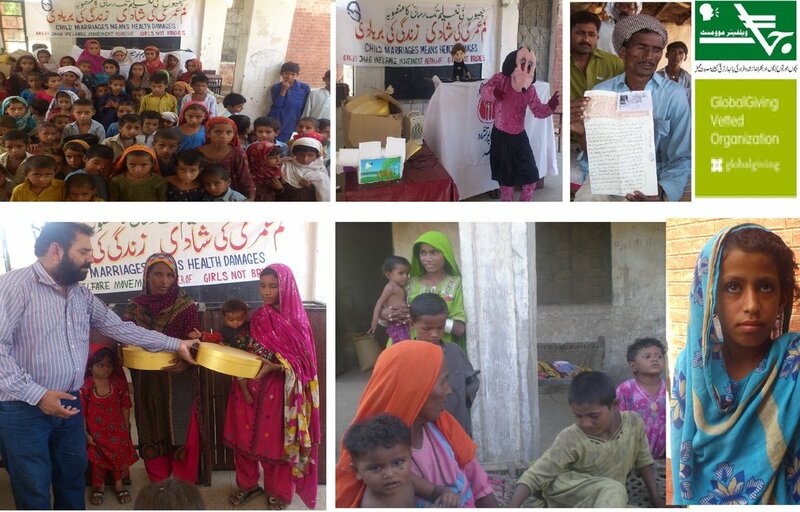 Jaag provides nutrition, medicine and healthcare to child brides. Jaag provides skill training, small Industrial unit for economic empowerment to delay first birth. Jaag mobilizes communities through interactive street theaters / puppet shows to stand against child marriages. Jaag organizes consultation & lobbying meetings with parliamentarians & media for law reforms to end child marriages. The project will retain in school 250 girls at risk of child marriage while 250 child brides will be healthy, economically active and empowered to take decision to delay first birth. This project will lobby & advocacy to Government of Punjab to develop supportive policy framework with adequate resourcing to increase educational, economic and social opportunities for girls at risk of child marriage and married girls. Communities will be increasingly aware of the harmful impact of child marriage. Find another project in Pakistan or in Children that needs your help.